Wine red velvet in violet morocco case, lettered: Missale Ecclesiae Turonensis. Made for a member of the Lallemant family of Bourges, probably for Guillaume Lallemant, canon and archdeacon of Tours as well as canon of Bourges and Tournai, whose arms (gules a chevron or between three roses argent centered or) are found in the margins on fols. 8r, 10r, 13r, 50v, 61r, 121v, 136v and 144r; A. Firmin-Didot sale (Paris, 1879, no. 18) to Fontaine; Robert Hoe Collection (Grolier Club exhibition, 1892, no. 63, 2 pl. ); his sale (New York, 1912, II, no. 2496) to Quaritch; purchased by J. Pierpont Morgan (1837-1913) from Alexandre Imbert in 1912; J.P. Morgan (1867-1943). Ms. missal for the use of Tours (the feasts, two litanies); written and illuminated in Tours, France, ca. 1500. The ms. is most recently dated ca. 1500 - 1503. 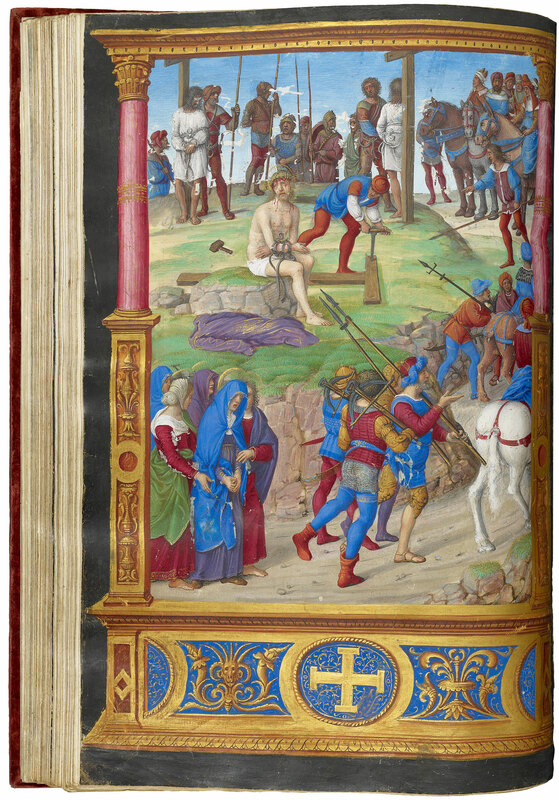 Jean Lemaire de Belges's "La plainte du désiré" of 1503/4, which praises Poyer among famous deceased artists, gives a terminus ante quem for the manuscript. Artists: Jean Poyer and the Master of Spencer 6; all five large miniatures, one historiated initial, and their borders are by Poyer and the remaining small miniatures are by the Master of Spencer 6. Reflectography and band pass filters have revealed detailed underdrawings under Poyer's miniatures (Wieck, 2000, p. 32, fig. 23). Decoration: 5 large miniatures, 18 small miniatures, 1 historiated initial.